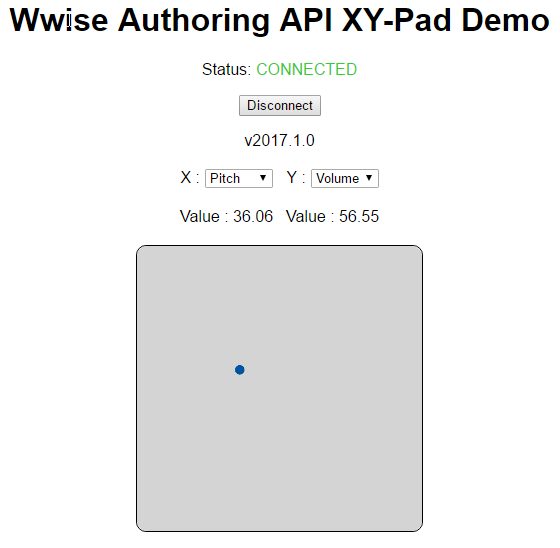 In my previous article, we reviewed a few of the various possibilities where the Wwise Authoring API (WAAPI) can be used to integrate Wwise with other applications, and also to add custom functionalities to Wwise. In a nutshell, WAAPI allows any applications or scripts to remote-control, query, or modify the Wwise project data. WAAPI, therefore, opens all kinds of possibilities. Today, we will walk through an example of putting WAAPI to use. We will look at the implementation of a simple web application which, with a single movable point, provides an X-Y pad to control two game parameters at the same time within a 2-dimensional area. 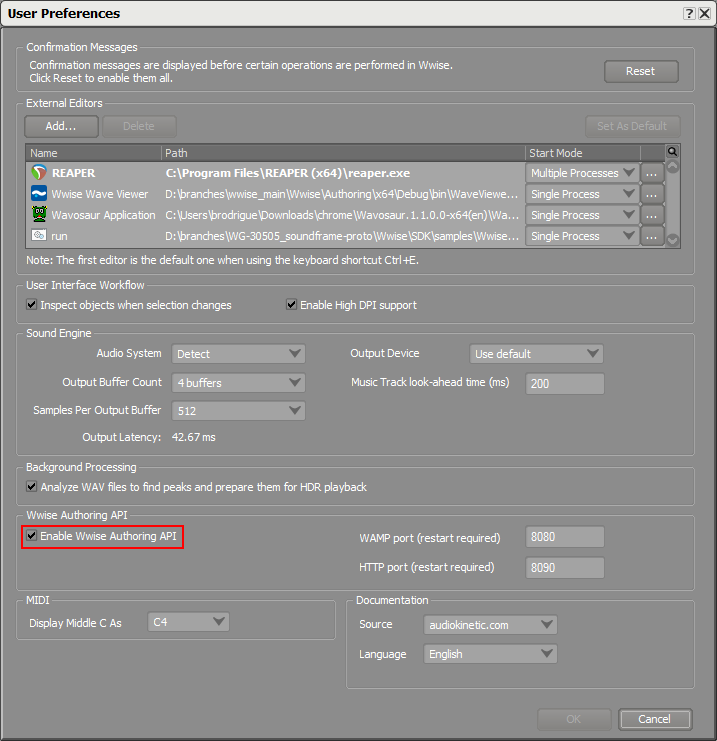 The application connects to the currently opened project and displays the available Game Parameter objects. The nice thing about this demonstration is that it works with any Wwise project. But for this article, we will create a simple Wwise project that implements a Theremin musical instrument. Create a new Sound SFX object. Select the newly created object. In the Contents Editor, Click the Add Source >> button. 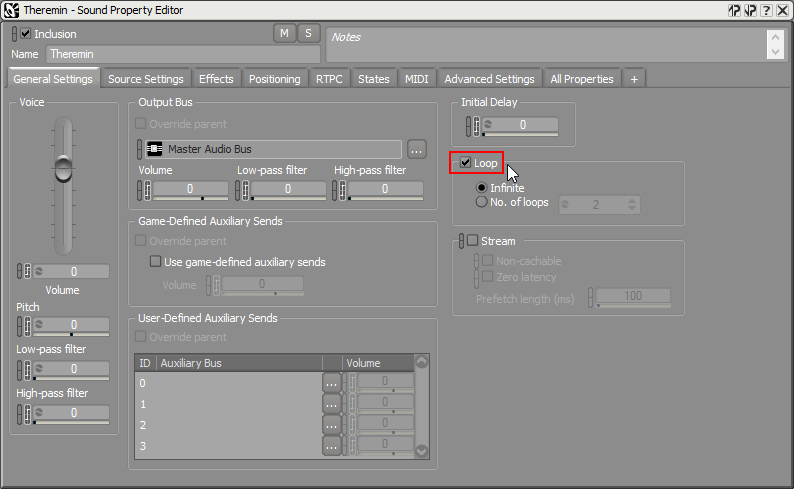 In the Property Editor for the Theremin object, enable Loop. Go to the RTPC tab of the Theremin object. 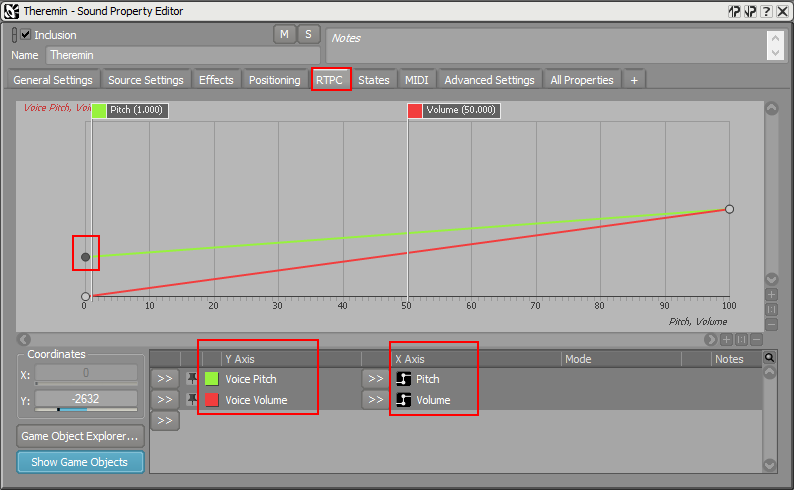 Assign two new Game Parameters “Volume” and “Pitch” to the Voice Volume and Voice Pitch properties. Modify the Voice Pitch curve as shown below. That’s it. Now save your project! Click menu Project > User Preferences. 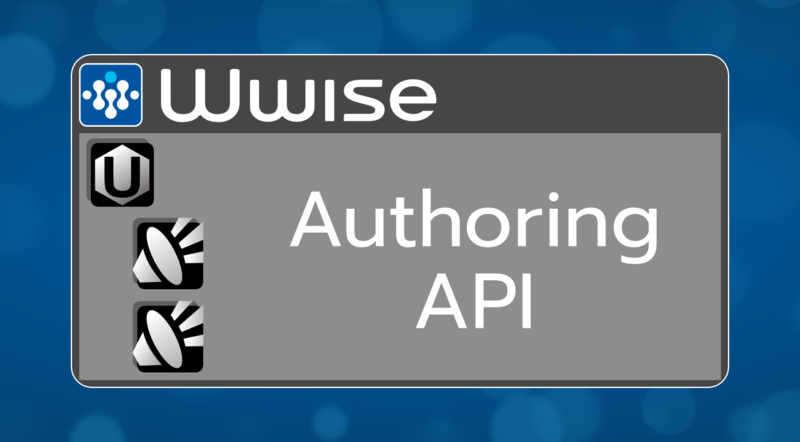 Click Enable Wwise Authoring API. Now let’s take a look at the actual web application. This application shows a blue dot, which allows to modify two distinct game parameter values while connected to Wwise. Once connected, the sample will retrieve the list of game parameters from the project. In our example, it retrieved the Pitch and Volume game parameters. From there, we can hit Play in Wwise and move the little blue point to get our theremin working. OK, let’s look at how this has been implemented with WAAPI. Please take a moment to look at the readme.md file to learn how you can install dependencies and how to run the sample. This is crucial because the sample won’t work if you don’t install dependencies. Most of the code for the application is located in js/app.js. Remote Procedure Call (RPC): Execute a function remotely, with arguments, and obtain results. Subscribe/Publish (Pub/Sub): Register to a specific topic, and get notified when something is published about that topic. Args: Arguments for the function, described as a JSON object. The Wwise SDK documentation describes all arguments required for every RPC call. Options: Options for the function. Can be an empty object. Then, the call function will return a promise object, which can be used to specify a success callback to receive the results, and an error callback to receive the errors. This remotely calls the URI ak.wwise.core.object.get, which takes a query object as arguments, and returns a list of objects with the specified options. In this scenario, the query specifies a source (from all objects of type “GameParameter”), which returns all game parameters. 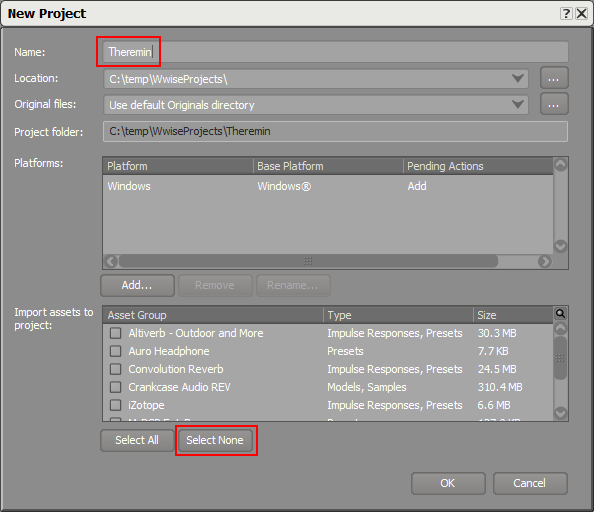 Then the option component specifies what to return from these objects. This allows you to capture plenty of information from a single query. 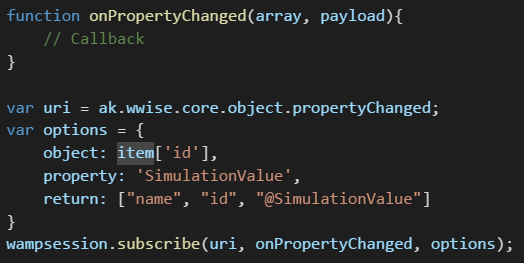 Modifying the Game Parameter simulation value directly inside Wwise will also update the x-y pad application automatically, because we subscribed to the topic ak.wwise.core.object.propertyChanged. The blue dot is two-way bound to the actual Game Parameter value. This sample only covers the tip of the iceberg in terms of functionality for WAAPI. Take a look at the WAAPI documentation to find out more about all functions available, what arguments they require, and what they return. 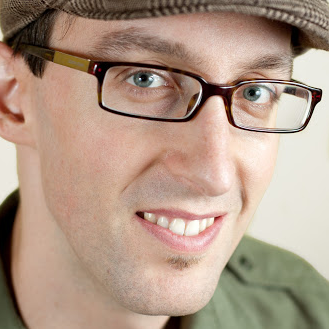 Bernard Rodrigue is Director of Development at Audiokinetic. He joined Audiokinetic in 2005 and actively participated in developing the foundations of Wwise. Today, Bernard continues to lead several projects related to the advancement and expansion of Wwise.